They click the link and the transfer starts. Once the transfer is complete you can close the page. Why is this cool? Suppose you’re trying to send someone a large file as an email attachment, but their email service has a size limit on attachments (a 25 MB limit is not uncommon). This lets you send them a link instead and it won’t eat up all their inbox space. 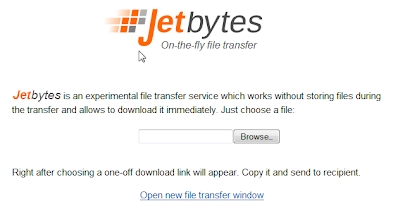 There is unfortunately a downside to this method: you have to leave jetbytes open in your web browser until they have downloaded the file. So it works best when you know they are at their computer. Edit: Another way to go for online file transfer is DropBox. I've breifly posted on how to share files with it here.